Walter Frey’s incredible collection of Mazdas is now on public display in Germany at the carmaker’s first official museum outside Japan. Augsburg is less than an hour’s drive on the free-flowing autobahn from the Bavarian capital Munich—or a bit longer from the fairytale castle of Neuschwanstein, if you’d rather sprinkle your holiday with spires and ramparts than steins and dirndls. One of Germany’s oldest cities, Augsburg is conventionally charming, with its well-preserved medieval guild houses and church. But the guidebooks need updating: as of May 2017, there’s a new heritage landmark in town. 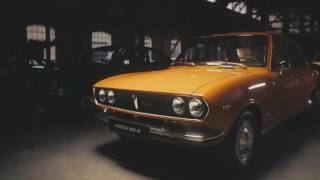 The Mazda Classic Automobile Museum Frey is not just Mazda’s sole officially sanctioned heritage museum outside its Hiroshima headquarters, but an astonishing testament to the limitless passion and painstaking labors of one German family, the Freys. Seventy-two-year-old Walter Frey, along with his sons Markus and Joachim, has amassed a collection of more than 120 Mazdas, a third of which are now housed in a beautifully restored former streetcar depot, forming a stunning concours-quality display that’s open to the visiting public. With immaculate examples from every era of post-war Mazdas, this priceless gathering of vehicles distills the history of the marque into one handy 5,300-square-foot area. You can chart the evolution of three-wheeled workhorses and minicars from the 1950s and 1960s, marvel at the blossoming of the Mazda rotary engine and the various models that made it so successful in the 1960s and 1970s, and trace the numerous technical innovations of the 1980s and 1990s. There are rugged utility vehicles, path-breaking sports cars, plush sedans, even a rotary-engined 26-seater bus, the Parkway. Rarely seen Mazda models—the little two-stroke-engined 1972 Chantez; a 1975 Mazda Roadpacer AP—a luxury sedan of which only 800 models were ever built; a cabriolet version of a 1987 323 Familia; a 1993 626 with four-wheel-steering; a tow-truck version of the 1974 REPU pickup—flank the marque’s more familiar legends, from the pioneering 1968 Cosmo Sport to the gorgeous 1992 RX-7 FD. This cornucopia is laced with a variety of memorabilia: from period advertising posters and watercolor sketches by former Mazda designer Mikio Nakajima to a cutaway model of a rotary engine and die-cast scale models of Japanese police RX-7s. The café and shop also make for pleasant breaks, with the net result that, for the Mazda enthusiast traveling to or through southern Germany, it is hard to imagine a better waypoint to spend a day. Even their family holidays are centered around travels abroad to examine or acquire more rare heritage models, or road trips in one of their Mazdas (the Parkway is a favorite). Their voices drop to a reverential hush as they speak of meeting Mazda’s legendary rotary-engine designer Kenichi Yamamoto in person. One Christmas, Markus and Joachim presented Walter with an original wooden bench from the workshop of rotary-engine inventor Felix Wankel himself. Mazdas and rotaries are in their blood. Walter began his journey to automotive mania—and he is unarguably the highest degree of car nut, owning more than 200 cars of all marques, and not just rotary cars but also rotary motorcycles and even an aircraft—as a dealer of Russian Ladas, back in 1971. The Bertone-penned RX-87 entered production as the R130 Coupe. The Freys say it is one of their favorite cars, and one can see why. The head-turning lines, all sleek elegance and taut muscularity, are a winner. But it was its powerful twin-rotor engine, driving the front wheels and capable of delivering a 120 mph top speed, which helped earn the R130 the name “the lord of the road” in Japan. One of the oldest Mazdas in the museum is this superbly restored Type GB. From the first Type DA (Mazda-Go) in 1931, Mazda’s three-wheelers proved to be an economical, practical, and extremely successful transportation solution that played a vital role in Japan’s post-War recovery. The three-wheeler family eventually spawned 30 different variants, from a simple 9.5 hp model to ones with a two-ton payload. Could this be one of the rarest Mazdas ever? This multi-purpose 4×4 utility vehicle was built in Myanmar in the 1970s, primarily for that country’s government, military, and police forces. With their no-frills design and tough build, examples served well into the 2000s. This particular car somehow found its way to Hamburg, where it lay abandoned for years before Walter bought it and gave it a new lease on life. Alas, its engine was simply beyond repair, so it now runs a 929’s power unit. Mazda has always excelled at delivering exciting performance in a compact package, and this hot version of the 323 hatchback is a case in point. Actually a homologation vehicle for rally versions, the GTR was a real thoroughbred, with all-wheel-drive and rear locking differential. Save for its prominent additional air intakes and spoiler, it was a real Q-car—the optional Comfort package made it a great daily ride, yet it could blaze its way to 135 mph.